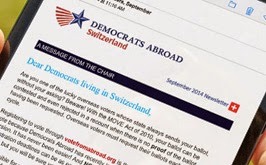 Democrats Abroad Switzerland: FIRED UP... READY TO GO!!! FIRED UP... READY TO GO!!! Lots of our members have already voted in their state's presidential primary. This makes you ineligible to vote in the Global Primary. BUT - our May 3rd Global Primary is also an event for Democrats to come together. We have a great program ready for you from 7-8pm so come join us and support DACH, hang out with fellow Dems and get FIRED UP AND READY TO GO for Barack Obama! !